So we decided to go for exposed beams. 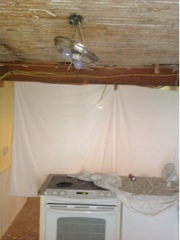 Today was the mess, tearing out old plaster. Trever Howard, our handyman, changed race as we watched! What a huge mess! Dust, plaster, dust, sand, dust, and plain ol' dirt covered all surfaces. 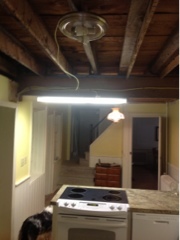 Above shows the ceiling taken down to the lath. Our pretty kitchen is again a wreck! (See Kitchen tab for more on the changes we have already made to Kitchen. Then the drop cloth on the stove caught fire! Trever got it out quickly, but there is a little melted sheet on the glass top stove. He swears a razor blade will fix it. News on the Volvo-they think it is a starter solenoid. More details from them tomorrow. Still humid and overly warm. Not the 100 that Little Rock had today, but very warm if you move around much. I told Trever to stop sweating on my floor. It makes it hard to sweep up dust. Tomorrow we have plumber, to fix the leak in pipes he can now see, Trever back to finish demolition, and electricians to put in more outlets in bedrooms, bathroom,and kitchen. And to install a whole-house fan in the attic. Oh, and a mason to look at chimney repair. Another day in contractor hell.